Flower girls are sure to be an adorable part of your wedding day, getting guests camera-ready before your big aisle debut! With their dresses picked, the shoes and tights ready, flowers are the final and important component to the girls' overall look and role in the wedding. Below, we created a list of the most popular ideas for your flower girl's flowers! Find what works with your wedding style and what she's comfortable sporting! Remember, you can always mix it up and have each flower girl carry something different. Head wreaths are on trend for 2016. They are popular for adults, with many brides and even guests sporting large, blooming floral crowns. We always love head wreaths on our flower girls too! Head wreaths never fail to create an enchanting, ethereal look. Oversized crowns with lots of flowing greens and scattered blossoms are an adorable look for your little one! Petals are fun! It is always so sweet to see flower girls throwing loose petals down the aisle and creating a little trail for you to walk down at the ceremony. Typically, rose petals are the best choice, although little blossoms can also create a sweet look. Many times a decorated basket is the perfect vessel for the petals, although other creative ideas like handmade paper cones can create a signature look. 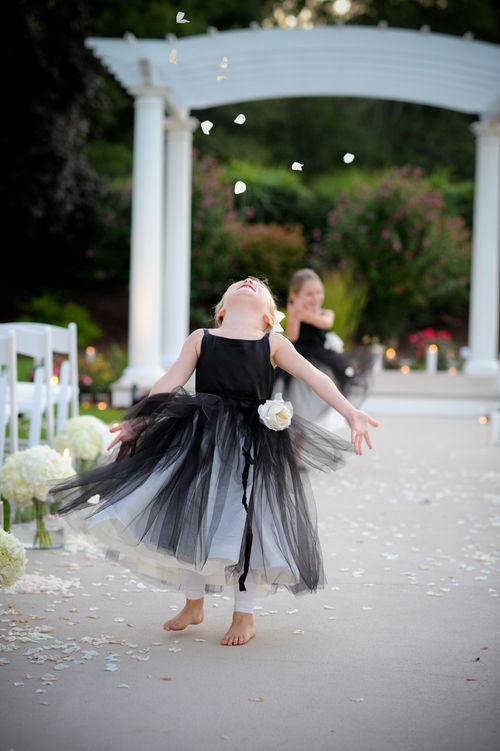 Before deciding that your flower girl will toss petals, be sure to check with your venue to see if they allow them to be thrown. Miniature bouquets are simply adorable. Having mini versions of the bridesmaids' bouquets creates a cohesive look and lets your flower girl feel like one of the adults. When choosing this style for your flower girls definitely consider their age in your decision. A handheld bouquet requires a little more care and attention when carried. Pomanders are another great choice if you want your girls to carry flowers down the aisle. Unlike the handheld bouquets, pomanders are great for all ages because they are a hands-free look. A thick loop of ribbon allows the ball of flowers to be easily carried, even by small hands. An array of flowers can be used to make pomanders for an overall fun and elegant look. Baskets with flowers are a traditional look for your flower girls to carry. Fun elements like the beaded purses below can add a colorful twist to this traditional style. Like the pomander, baskets can be easy to carry and an essentially hands-free design. Many times the basket can become a keepsake for the flower girl after the wedding is over.